Hoopin’ It Up will reduce your learning curve and have you enjoying your first lobster dinner in no time at all! 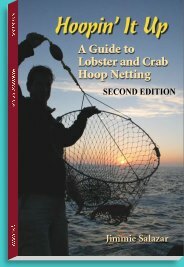 This book will show you how to rig your nets and pull up your lobsters, and how to cook them with some great recipes. Or... if you prefer to get the book immediately you can pick it up at your local fishing tackle store.